On Saturday 27th April 2013 I ran the Wray Scarecrow Festival 10K Road Race. The village of Wray lies in the rural heart of North Lancashire alongside the banks of the River Roeburn, approximately 8 miles to the East of Lancaster. The scarecrow festival runs (excuse the pun) for the full week preceding Bank Holiday Monday and has been established since 1995. I had heard this was a great event and I had been looking forward to running but I very nearly missed it (and I can't even blame my ankle this time). I had it in my head (and written on my calendar!) that the race was on Sunday 28th April. On Friday 26th April I decided to get my race number and details out early to check the start time and was shocked to see that it was actually on the 27th! Phew, close one! Imagine getting a DNS due to stupidity! After fuelling up the night before on Pie and Peas washed down with wine at a pub quiz evening (a pre-arranged event I couldn't cancel). I was rather nervous at the thought of successfully running a 10K after an evening out. Luckily I had the morning to recover as it was an 1.15pm race start time. I had porridge at 9am, then toast and jam at 11am to keep my energy levels up but I didn't want to run on a full stomach. I found it quite a difficult start time to work food around! We left Kendal at 11.45am for the 27 miles journey and arrived at around 12.30. As we approached the village we saw a field with the words "Read me" in it. At this point I wondered what this was all about as I wasn't aware there was a scarecrow theme! 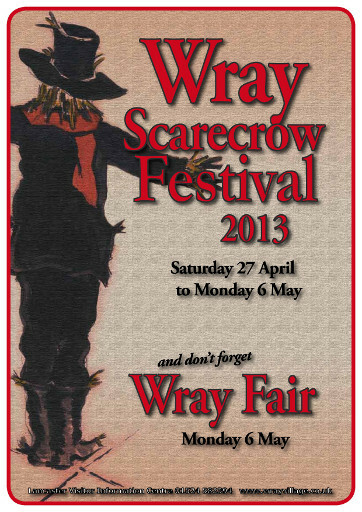 I later found out that this years Scarecrow Festival had the themes "Read me" and "Myths and fairy tales". The Organisers had opened a field up as a car park, charging £1.50 but I didn't mind as it took the stress out of parking and the money was going to a good cause (I think!). The car park Marshall made my day when he said to me "Good Luck with the run", my husband replied "What makes you think she's running it and not me?" to which he replied "No offence mate but she looks like a runner and you don't!". It really made me lol! After drying my tears of laughter, parking the car and visiting the portaloos (amazingly NO queues whatsoever) we headed into the village to find the start and finish points. 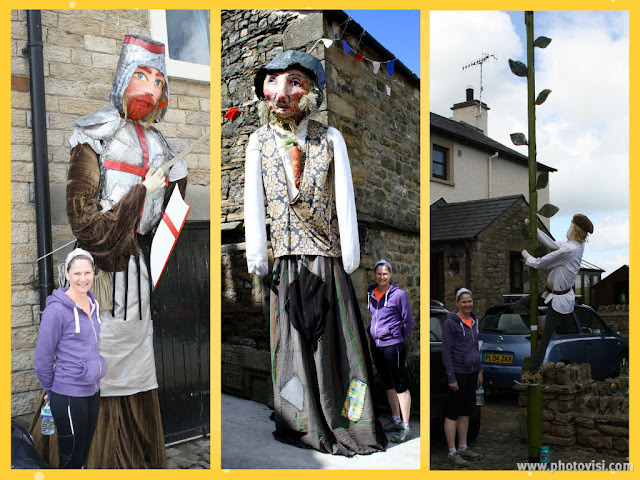 Once we had located these we still had time to have a walk around the village to view all the scarecrows. A selection of the scarecrows! They were all fabulous but I think the one that made me chuckle the most was the one called "50 sheds of Wray" . You can see more photo's of the scarecrows here. After seeing all the scarecrows we headed to the start area and I watched from the sidelines as many of the "elite looking" runners performed strange warm-up exercises and stretches. I conserved my energy for the real thing but perhaps I need to do this to become elite!!! We were soon on the start line waiting for our starting orders. The weather was great and we even had that strange orange orb in the sky that we have seen so little of lately! I heard a lady near by say to her male companion "I want a PB today so make sure I get a sub 55 minute finish". My times have dropped significantly since my injury and I thought that this sounded like a good target for me to aim for, so I positioned myself behind these two runners with the theory that if I kept up with them I too would get a half decent time! I basically allocated them the job of my pacers without their knowledge! Once we were all gathered in the road (the traffic through the village had been temporarily stopped at this point) the starter counted us down 3...2...1...GO! I started my Garmin then I tried to remain calm and kept reminding myself to relax and breath! I was still hot on the heels of my pacers when just after the 1 mile mark we hit the first hill - and boy did it seem to go on and on and on and on! I kept going strong and was delighted to reach the top and still have sight of my pacers! The roads were all open to traffic but were very quiet and didn't pose any problems. I was starting to feel very warm as the sun was shining down on us (I'm not complaining) and my only thoughts were to keep in touch with my pacers! At mile 3 we came across a water station, serving water in plastic cups. I slowed right down to gulp my drink and soon realised that my pacers had "downed in one and gone" so I had my work cut out to catch them up! I somehow managed to make up the distance and kept at a relatively safe distance behind them so they didn't realise they had a stalker following them! By mile 5 they were starting to break away from me and my legs wouldn't respond however hard I tried. By the 6 mile marker I had lost sight of them but was close enough to the finish line not to be too demoralised. As we came into the village the traffic became a bit of a problem and this slowed me slightly (good excuse) but then the spectators boosted me and my speed increased as I approached the finish! I was delighted to finish and stopped my Garmin which recorded a time of 55:51. This wasn't a chipped event but the gun time was actually one second faster than my Garmin at 55:50. My pacers managed to hit target and came in at 54:52! I was chuffed with my time considering I still haven't managed much training and I now feel I am finally on the way up! You can view my run here. Water was served at the finish line in plastic cups, after downing a couple I got an 99 ice cream from a well positioned ice cream van before settling myself on a wall to clap in the remaining runners. No T shirts, no mugs (except us) , no memorabilia, no bling! Just a lovely course (quite hilly but with beautiful countryside and views), fantastic weather and lots of supportive friendly spectators! 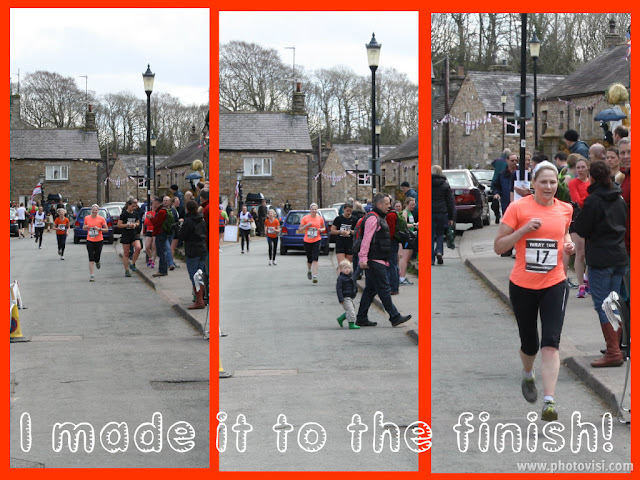 The race was fairly small with just 92 runners but it felt a much bigger event due to all the visitors in the village and there was plenty of spectators. I would definitely recommend this race and it will probably go down as the friendliest I have done! Enjoyable in a once you have finished sort of way! I have just been watching the video of the start line and it was described "as one of the toughest 10K road races around!" YIKES! It's a good job I didn't know that beforehand or I might not have entered! You can see this video here! 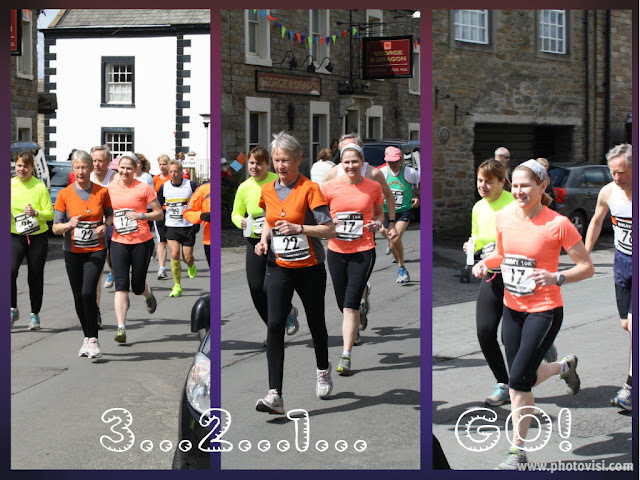 Look out for the flash of orange that is me near the back of the pack! 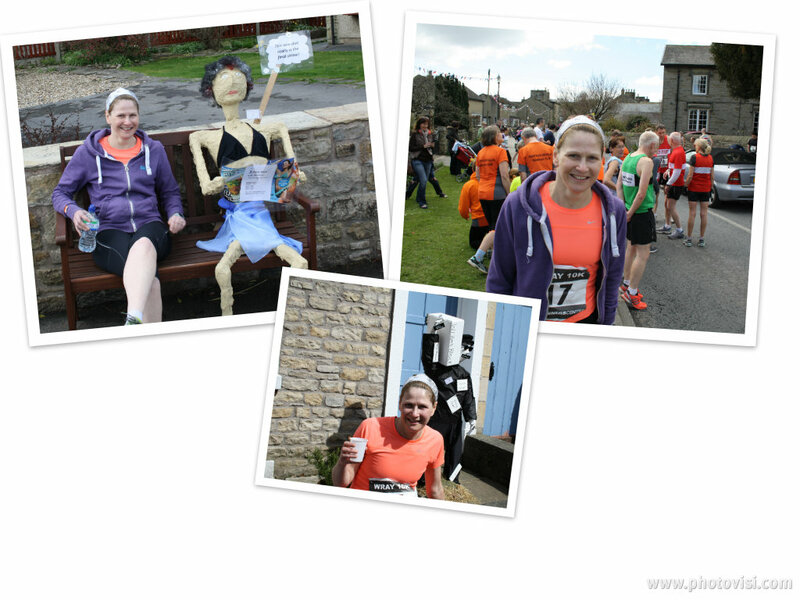 You can see the full list of Wray Scarecrow 10K results here! From studying the results it appears I am second in the W45 category! Very chuffed with that! I will definitely return next year and hope to get a PB!